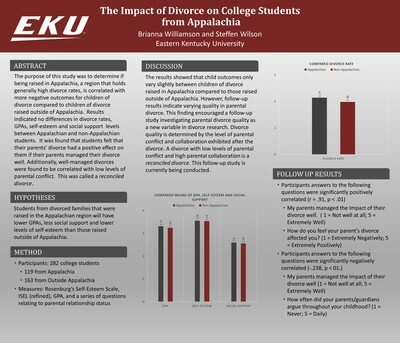 The purpose of this study was to determine if being raised in Appalachia, a region with generally high divorce rates, is correlated with more negative outcomes for children of divorce compared to those raised outside of Appalachia. In this study, various outcomes were assessed in relation to parental divorce in college students that were raised both in and out of the Appalachian region. The results showed that child outcomes only vary slightly between the two groups. However, post hoc results found that if participants rated their parents as having managed the impact of the divorce well, they also indicated a higher rating (more positive) when asked how they felt that their parent’s divorce affected them. Additionally, there was a negative correlation between the answer on the aforementioned question and participants rating of their parents arguing frequency. These findings prompted an ongoing study to investigate the concept of a “reconciled divorce”.